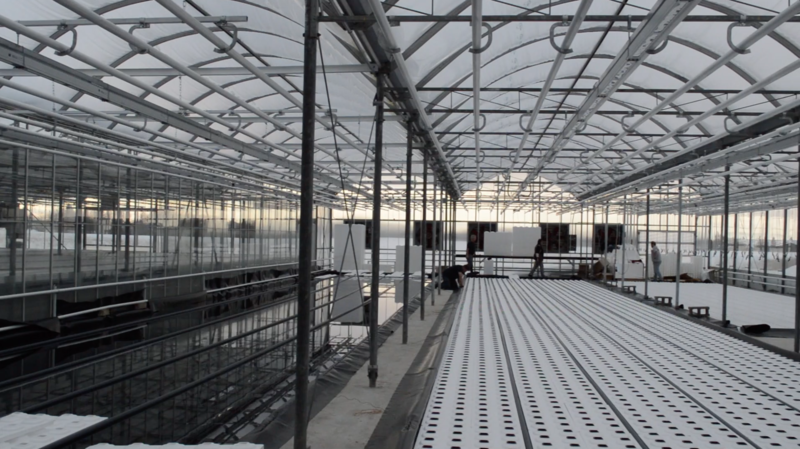 Thiel’s Greenhouses will be offering fresh greens throughout the year by way of new growing technology in the Bruderheim area ­– dry hydroponic vegetable growing. Funding for her Fresh Greens project began with a $25,000 crowdfunding project offered by Alberta Treasury Branch. When she finished just shy of $30,000, Stielow realized she had the interest and engagement of the community she was hoping for. As crowd funding would not be enough to fund the entire project Stielow continued through traditional lending institutions. Currently, Stielow’s dry hydroponic system is set up to grow between 1,500 and 1,900 heads of lettuce a week turning a new crop every seven to eight weeks of five to 10 different items. Height in her greenhouse does not permit the growing of high-wire items such as tomatoes and cucumbers. As a result Stielow wanted to focus on what could be grown on the dry hydroponic system. This includes leafy greens, spinach and herbs. She is aiming for the market of food service, restaurants as well as direct sales. Theil’s will also be examining the possibility of a future farmers’ market on their land where other local growers could come to sell their goods. Inspired by a form of hydroponic growing technology from the Netherlands, Stielow researched and studied for three years before bringing it to her Bruderheim Greenhouse. There are many hydroponic growers in Alberta, but what makes Theil’s unique is their use of this particular hydroponic system. All of the water used in dry hydroponics is contained in a closed system with levels being topped up as needed. Although Theil’s uses clean growing techniques without the use of pesticides, growing by way of dry hydroponic is not considered organic. Last year Stielow was able to tour a dry hydroponic facility in the Netherlands where she saw some very innovative growing techniques. Back in Alberta, Stielow first saw this system in action at Duke’s Greenhouse in central Alberta. Mentoring with Duke’s, Stielow was able to learn even more about the dry hydroponic system and how to implement this into her own greenhouse. In addition to year round crops, the dry hydroponic system is very attractive as once it is set up crops can begin to be grown immediately. This month, working with consultants from Holland and Ontario, Stielow’s vision is coming to life. Thiel’s Greenhouse will be only one of two greenhouses in Alberta offering year round vegetables grown by way of a dry hydroponic system. Their first crop is slated to be ready for early April. Currently Thiel’s employs 15 – 20 seasonal people with one employed full time all year round. Stielow explained that she does not have immediate plans to expand her number of employees, but this may change as her fresh greens project grows.